Telemedicine is a convenient way to see your doctor from the location of your choice with out having to travel to the doctors office. Telemedicine is a convenient way to see your doctor from the location of your choice with out having to travel to the doctors office. 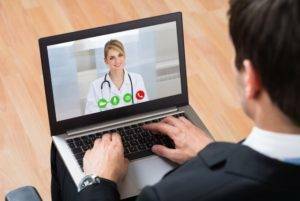 With telemedicine, you do not have to wait in the waiting room and exam room. You can now see a telemedicine doctor from your home, office, or any location on your computer, tablet, or smart phone. On time at your convenience. Here at Nouveau Health, we use telemedicine as a way to communicate, deliver, and coordinate your health care from a remote site while still offering direct face-to-face patient care. In simpler terms, we have state-of-the-art electronic medical record systems with two-way patient portals. This will allow you to register online and fill out patient forms and medical history at your leisure. Medical history can include: past medical history, surgical history, social history, allergies, medications and family history. This information, flows seamlessly into your HIPPA compliant electronic chart. We have the ability to order lab tests at your local lab electronically, or send you a paper requisition. After your labs are drawn, your results will bridge into the electronic medical record system, after which the physician will review them. Once reviewed, one of our staff members will call you to set up an appointment. The appointment can then take place via Skype, or via telephone, whichever you prefer. Appointments can take up to an hour depending on what is needed, so prepare accordingly. We require women to have yearly mammograms and that men have yearly prostate exams. Patients must also have a local physician who can perform physical exams if one is needed or requested by the Nouveau Physician. All lab results, health records, and after visit instructions will be visible to you online via your secure patient portal. To learn more about how our telemedicine appointment works, give us a call at (858) 866-6342 today!